How Does Solstice East Help Teens with Low Self Esteem? Solstice East is a residential therapeutic-based treatment facility. By adopting a holistic approach when it comes to treating low self-esteem in teenagers, our team has been able to build trusted relationships with our patients. Our treatment options range from therapeutic measures, to psychiatric help, and also academic observations and interactions. We base our approaches on real-life tactics and help our patients learn to cope and establish tools which they will take out into the real world. We believe that no two teenagers are alike, and therefore, we take a natural approach in healing teenagers with low self-esteem. Once we assess your teenager, our staff at Solstice East works together to create an environment that is safe, secure, and also academically empowering. Our treatment options include: various therapy sessions, social skills and academic classes, proper nutrition, physical fitness, everyday life situations, and total body and mind relationship building. What are the Causes of Teenage Low Self Esteem? Low self esteem in teenagers appears to correlate with issues that emerge in puberty. Although boys and girls report similar levels of self-esteem during childhood, a gender gap emerges by adolescence, in that adolescent boys have higher self-esteem than adolescent girl. Girls with low self-esteem appear to be more vulnerable to perceptions of the ideal body image perpetuated in western media (through methods such as airbrushing models on magazine covers). In essence, teenage girls are hit much harder with unrealistic standards of beauty than their male counterparts. This leaves young women feeling isolated, vulnerable, and unable to cope with society. Low self-esteem is very delicate because it aligns directly with a young woman’s perception of herself. Both environmental and natural factors cause teenagers to have low self-esteem. Some examples are: body image and development, body weight, obesity, television time, participation in team sports, performance in school, parenting style, race, and gender-specific variables. Self-esteem, as an overall reflection of an individualâs self-worth, encompasses beliefs about oneself as well as an emotional response to those beliefs. Low self-esteem has been associated with a number of psychological, physical, and social consequences that may influence successful adolescent development and transition to adulthood, including depression, anxiety, suicide and disordered eating, violent behavior, and substance abuse. At Solstice East, our therapies include: individual therapy, group therapy, milieu therapy, equine therapy, real-world academic and skill-building classes, and emotional support. Because low self-esteem in teenagers can lead to other disorders, our therapy can also consist of psychiatric treatment. Self-esteem is a lifelong journey, and we provide the tools for young adults to navigate their way through the uncertain future voyage of life. 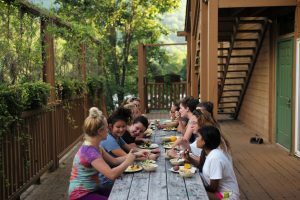 Solstice East provides teenage girls with an approach to healing that has been specifically developed to fit their needs. Whether itâs our uniquely designed equine program, or the clinical specialization and collaboration of our therapists, Solstice East is highly qualified to address the complex needs of adolescent girls on the road to healing. 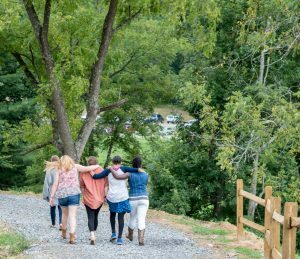 Solstice East creates a safe, secure environment for teenage girls. This allows them to follow a path of self healing and reflection. Our program is family-focused and puts an emphasis on keeping in constant contact with our girls’ families through family therapy sessions, family seminars, multi-family groups, and experiential interventions. At Solstice East, self-sustaining, lifelong change is created through remarkable people and programming. Students at Solstice East participate in regular workouts and develop fitness goals aimed at improving their cardiovascular fitness, strength, and flexibility. Girls participate in daily aerobic workouts which include running, biking, and aerobic classes. They all participate in other weekly workouts including Yoga, Pilates, Zumba, and boot camp. Girls also participate in various forms of community service twice a month. This gives them an opportunity to look beyond themselves and give back to their community. 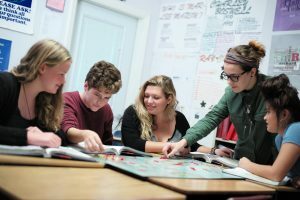 Unlike many other programs for struggling teens, Solstice East has one of the leading academic programs designed specifically for troubled youth. Academic struggles can be due to lack of motivation lack of success, attention, or learning style challenges. Having a traditional school environment mixed with residential treatment helps teens get back on track academically. 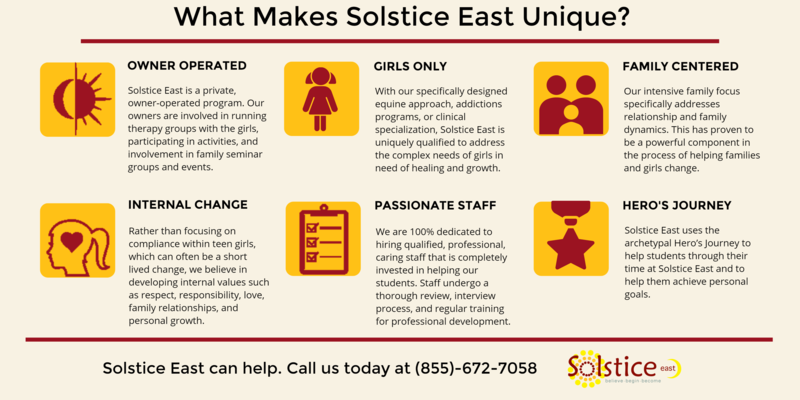 Solstice East has designed an academic approach to meet young women where they are academically and help them develop an individualized academic plan to restore good academic standing. They provide small classes, personal plans, and strong support to help students achieve. Wikipedia With over 5 million articles in English alone, Wikipedia needs no introduction: it is, by far, the biggest and best-known encyclopedia in the world. Containing articles on virtually every known subject, Wikipedia outlines the history, symptoms, and research of mental illness. Although it lacks professional oversight, Wikipedia is an excellent stepping stone for further research.